On January 15th 2019, the UK Parliament finally gets its chance to have a say on Theresa May’s Brexit plan. The vote will most likely take place at 7 pm in the evening (at least that is what I heard on Radio 4), but for safety’s sake, the horoscope used is for 12.00. So what is likely to happen? At the moment, Theresa May seems to be ingratiating herself with just about anyone who is anyone, in order to whip up support for her plan. Question is, is she flogging a dead horse? 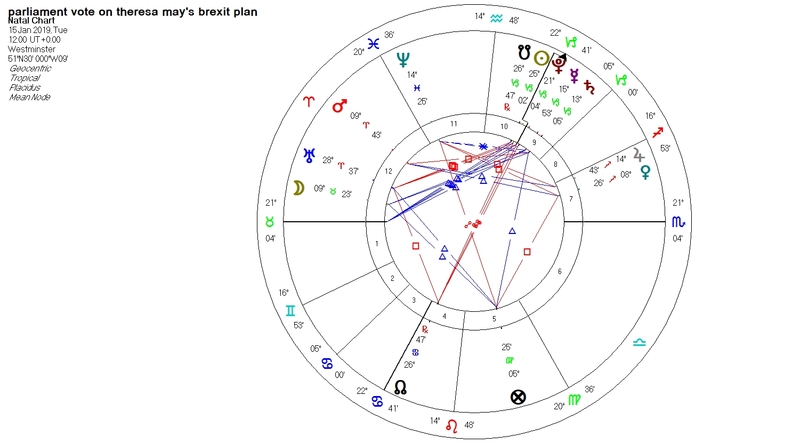 In previous posts on the Brexit vote (see links below) and in my article published in the Astrological Journal of Great Britain (the post Brexit vote edition), I stressed the importance of Mercury in Sagittarius in the UK horoscope. Mercury rules the UK 9th house, foreign affairs, relationships with foreign countries – and also the 12th house (house of self undoing). Mercury is the natural ruler of trade and in the UK 1801 chart, Mercury is in 17 Sagittarius 33 in the third house. On the day of the Brexit vote (June 23rd 2016), UK Mercury was right in the middle of the mutable fray. You may recall… there was a grand mutable cross on the day of the referendum vote … Mercury in Gemini opposed Saturn in Sagittarius, squared Jupiter in Virgo opposite Neptune in Pisces. I hope whoever came up with the idea for that referendum, is still looking for a job! In mundane astrology, Parliament – and the House of Commons in particular, is ruled by the 11th house, in UK chart the 11th house ruler is the Sun. The 10th house represents the Government, and the UK 10th house ruler is the Moon. The 4th house rules opposition to the government, in the UK chart 10th house ruler is Saturn. I find it interesting that the Sun is currently in Saturn’s sign, which already suggests that there is a lot of weighty opposition in the House of Commons (also amongst Tory MP’s) against Theresa May’s Brexit plan. The vote is taking place slap bang in the middle of eclipse season, and the South Node of the Moon is currently in Capricorn. In all, there are a lot of planets on the day of the vote in the 4th house of the UK horoscope, which in itself adds weight to the argument that the vote will not be carried. The upcoming lunar eclipse days after the vote falls on 21 January, in 0 degs 52 Leo, and it falls on UK Jupiter in the 10th house. 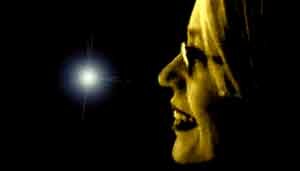 This really could be the fall of a woman in power, as her light- like the Moon’s – is put out. If this is how the eclipse manifests, then it will mean certainly mean curtains for Theresa May. (Interestingly, this eclipse also falls on David Cameron’s own Jupiter/Moon conjunction. Cameron is the orchestrator of Brexit). On the day after the vote, Mars in Aries squares UK Sun in Capricorn under very powerful conditions, both in terms of house placement (Mars is angular) and in terms of receptions (Sun exalts Mars, and vice versa). It is difficult in the light of the built up planetary picture, to envisage a scenario whereby Mrs. May can win this. The Moon is on Taurus on the day of the vote, which though exalted, could simply point to the stubborn nature of the Gov’t – which has dug its heels in and Theresa May who had doggedly stuck to her own agenda. This is what I think will be the most likely scenario, but we shall see. If I am honest, I find it hard to count out some sort of invisible hand guiding these strange events. Astrology gets you like that if your busy with it long enough. The pictures and patterns are sometimes just too bedazzling. Am I concerned as to what will happen next? There are two answers to that: Yes and NO. Let’s stay with Mercury – because as I have argued elsewhere when looking at the history of the UK relationship with Europe, Mercury is a key planet. Just one word is enough really: Neptune. Neptune is a tricky character, particularly when he engages UK Mercury. I left the UK just after the so called winter of discontent. The lorry drivers strike, the grave digger’s strike, the waste collectors strike… The biggest strike action since the 1920’s took place on January 22, 1979 under a transiting Venus/Neptune conjunction conjunct Mercury, squaring transiting Saturn and the Nodes. Fortunately, this year Saturn also sextiles Neptune – so at least there is some sense that the UK a Saturn ruled country – can navigate the storm in its own, grand, odd, antiquated and largely muddling way. But NO: The sceptered isle will not sink under the waves. The day after the day after, the sun will rise and if we are lucky, even shine. Sheep in Wales will fill their bellies with grass and in Scotland, someone someone will laugh with Billy Connolly. In the course of 2020, in its progressed horoscope, the Sun conjuncts Jupiter in Leo in the 10th house. That has something shiny and special about it. In my heart, I am hoping that the UK has heeded something from its Pluto transits. I have a sense as an astrologer, that something fundamental, something in the heart of the country has changed… But this is something to ponder for now. I will come back on it. Dit bericht is geplaatst in eclipsen, mundane astrologie en getagdBrexit vote, eclipses, Jupiter square Neptune, mundane astrology. Bookmark de permalink. 1 Reactie op Parliament’s vote on Theresa May’s Brexit deal: Flogging a dead horse?